I climbed the spiral stair to my loft, thoughts swirling but nothing sticking to the fly-paper of my creative energy. Writing was hanging over me, I needed to create and produce but couldn’t find the thread, and panicked I would never touch what lies beneath the surface of greatness. There in my inbox was the nugget that made me catch my breath. It all started out simply enough. While splitting wood the other day I came across a log that was strong and dry on the outside. Deep within the heartwood, a stark white substance flashed at me. When the log split, I smelled a rush of forest floor, pure mushroom so heady and strong it felt like an aphrodisiac. Laura grabbed her camera and shot these photos which we sent off to Alan from New Hampshire Garden Solutions. This is a good example of compartmentalization by a tree, in which the tree protects itself by sending toxins to the area affected by the fungus. 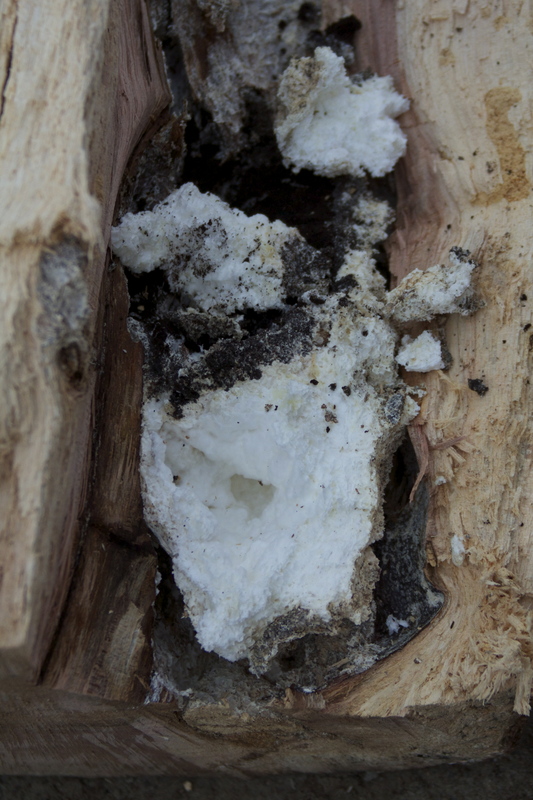 The tree will let the fungus rot the dead wood on the inside and protect its outer, newer growth rings. The tree actually surrounds the fungus and contains it in a “compartment” so it can’t damage growing tissue. It explains how and why huge trees can be completely hollow. It’s certainly something that isn’t seen that often! How could something so beautiful and luscious-looking be causing rot? Maybe the word just has the wrong connotation here? It felt like a clean, pure sponge. Then it hit me. The tree, or I, send toxins to an area of life that is being “attacked,” toxins of our own making. The area is sealed off from the rest of our daily consciousness. It doesn’t go away but it doesn’t impede, new growth. The idea that an organism can heal but still be hollow; strong while enduring the loss of “heartwood.” I will remember this during those times I doubt my ability to deal; whether it is the simple stress of road-rage while driving or more life altering moments. Life causes hollowness but it doesn’t affect my ability to stand tall and grow. This entry was posted in creativity. Tagged creativity, fungus, life challenges, New Hampshire, rot, writing. That’s a good way to look at it. I have great admiration for anyone who can write a daily blog because it’s such a lot of work.